Yup...hit or miss these days. But I am off work on a *staycation* this week so I figured I would put fingers to keyboard and actually type out the plan for this weeks dinners. In hopes it will keep me on track. Ha! I know wishful thinking. (We headed down south for the day to visit with some family so by the time we got back into town, it was eat WhatEver You Want or whatever doesn't take to long because momma ain't cookin). My bad, Kaylyn ate a bowl of cereal and toast. Hayden ate... not sure what he ate now that I think about it. I had some chips and salsa. Husband not sure. Tyler wasn't home. Not sure. Maybe out to dinner. We'll see. 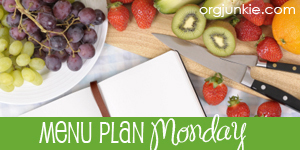 What do you have on your menu this week? I am linking up with I'm An Organized Junkie MPM. Need some more dinner ideas? Check it out. Lots to choose from.